1. Hundreds of thousands of American Robins can gather in a single winter roost. In summer, females sleep on the nests and males congregate in roosts. As young robins become independent, they join the males in the roost. Female adults go to the roosts only after they have finished nesting. 2. The American Robin eats both fruit and invertebrates. Earthworms are important during the breeding season, but fruit is the main diet during winter. Robins eat different types of food depending on the time of day; they eat earthworms early in the day and more fruit later in the day. 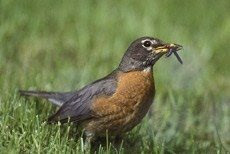 Because the robin forages largely on lawns, it is vulnerable to pesticide poisoning and can be an important indicator of chemical pollution. 3. An American Robin can produce three successful broods in one year. On average, though, only 40 percent of nests successfully produce young. Only 25 percent of those fledged young survive to November. From that point on, about half of the robins alive in any year will make it to the next. Despite the fact that a lucky robin can live to be 14 years old, the entire population turns over on average every six years. 4. Although the appearance of a robin is considered a harbinger of spring, the American Robin actually spends the winter in much of its breeding range. However, because they spend less time in yards and congregate in large flocks during winter, you're much less likely to see them. The number of robins present in the northern parts of the range varies each year with the local conditions. 0 comments on "American Robin Nest and Eggs"